To honor our servicemen and women, Dr. Michael Tracy’s Carlsbad ophthalmology office offers special discounts for laser vision correction surgery, such as blade-free LASIK and PRK (Surface Ablation), for all active duty military personnel and their spouses in the San Diego area. Military personnel are often involved in activities that are simply unsuitable for wearing eyeglasses or contact lenses. The compatibility of eye wear with night vision goggles, gas masks, and other devices is a constant source of concern in terms of safety, as well as performance of duties. LASIK and PRK offer patients restored vision and freedom from devices that can get in the way. We are hopeful that by providing the opportunity to have LASIK at a discount, military personnel will perform better and feel safer, and benefit from the convenience of not having to worry about caring for glasses or contact lenses. Only 15 miles south of Camp Pendleton, Dr. Tracy’s office in Carlsbad is the perfect place for servicemen and women in the San Diego area to get LASIK or PRK eye surgery. Please call our office for pricing information and to book a free consultation. LASIK and PRK are effective laser vision correction procedures that can treat nearsightedness, farsightedness, and astigmatism. They are quick outpatient refractive procedures that take about 10 minutes per eye. We understand the importance of eyesight for military personnel, and Dr. Tracy’s extensive experience will put you and your loved ones in good hands. LASIK at Carlsbad Eye Care is a 2-step process. During the first step, a thin round corneal flap is created, which is lifted to reveal the corneal tissue underneath. During the second step, an Excimer laser reshapes the cornea. The flap is laid back down and allowed to heal naturally, which usually takes 1-2 days. To create the corneal flap, Dr. Tracy utilizes the Intralase laser instead of a microkeratome blade. This is called “blade-free LASIK” or “Intra-LASIK” and is much safer than the traditional microkeratome. PRK is also a 2-step process. During the first step, the outer covering of the cornea (epithelium) is brushed away using a round rotating brush. 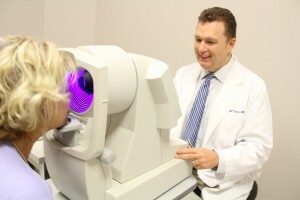 During the second step, an Excimer laser reshapes the cornea. A bandage contact lens is placed on the eye, and the epithelium is allowed to heal naturally, which usually takes 3-4 days. In PRK, no corneal flap is created. Thus, there is no chance of having flap complications, such as a displaced corneal flap. Since everyone’s eyes are different and unique, Dr. Tracy will carefully measure and map your eyes during your LASIK consultation. If appropriate for your treatment, a Wavescan machine will map your cornea before the procedure, to determine your Custom treatment. Dr. Tracy has performed over 5,000 LASIK and PRK surgeries and can help you decide on the best choice for your unique needs and lifestyle. Question: How long does the LASIK surgery procedure take? Answer: The entire procedure takes about 20 minutes, approximately 10 minutes per eye. Question: Will I be awake during the procedure? Answer: Yes, but you will be given medication to relax. Also, your eyes will be numbed with eye drops, so you will have no pain. Question: Do I have to have one eye treated at a time? Answer: No. Typically both eyes are treated during the same visit; however you can have one eye treated at a time if you choose. Question: Can I resume work after LASIK Eye Surgery? Answer: You can resume your normal daily activities after a few days, but strenuous activities that you may engage in as a service member should be avoided for a few weeks. For certain activities, you should wear goggles for 3 months to protect your eyes. If you or your spouse is a member of the military, Carlsbad ophthalmologist Dr. Michael Tracy offers discounts on LASIK and PRK eye surgery. Call our office to inquire about discounts available to you today. 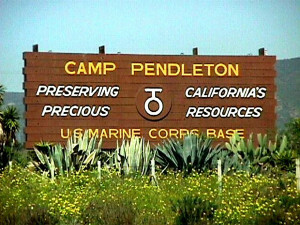 Our Carlsbad LASIK office is located 15 miles south of Camp Pendleton, in San Diego’s North County.